Dubbed 'the most beautiful film ever made' (so no pressure, then), Hero is a completely new cinematic experience. Oh sure, we've seen extreme martial arts action before, people soaring through trees waving swords in Crouching Tiger, Hidden Dragon, or suspended in midair in The Matrix. But trust me, you've never seen a film quite like this before. Skilful, intellectual and, yes, very, very beautiful, it's unlike anything else - and yet the style and structure of Hero hark back to ancient traditions of theatre and narrative. 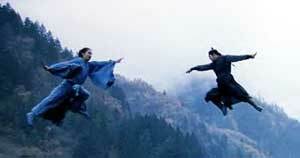 The action takes place in ancient China, at a time when the country was divided into individual warring states. 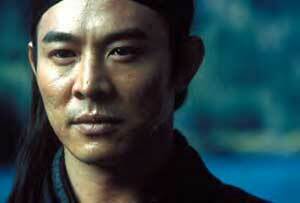 Jet Li plays Nameless, an impassive, stony faced warrior who has killed the three enemies of the King of Qin and has come to claim his reward. 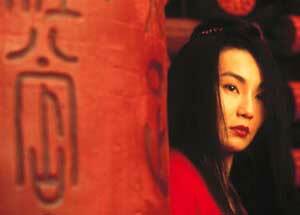 In flashback, he tells of the deaths of these warriors, Sky (Donnie Yen), Broken Sword (Tony Leung) and Flying Snow (Maggie Cheung). The tale he tells is one of jealousy and high passion, of love and hatred, betrayal death, and we see the scenes replayed in small, claustrophobic rooms and narrow corridors, the characters and sets draped in vivid and dangerous shades of red. There's only one problem though - the king doesn't believe him. So Nameless is forced to retell his story. This time, the passion is gone, replaced by intrigue, calculated decisions and self-sacrifice, and so we see the characters clothed in cool shades of blue, skimming the surface of a vast, deep lake. However, the king is still not convinced, and so finally, we get to the truth: stripped of deceptive layers, the characters' robes are now pure and white, they themselves tiny figures in a vast, rocky desert. Like a series of beautifully crafted Chinese boxes, the nested narratives gradually peel away to reveal the crux of the film. But whilst the stories themselves may change in style, their heart remains the same. Yup, each scene features one helluva fight. Like Crouching Tiger, these fights are breathtaking - characters fly through the air or race across water, leap across treetops and hurl themselves into gravity-defying attacks. Lightening flashes of swordplay are interspersed with sudden gasps of delicate slow motion; furious, flailing onslaughts parried by a barely imperceptible twitch of the body. This isn't fighting, this is poetry in motion, a perfectly choreographed ballet of exquisite steps, culminating in death that seems beautiful and noble. And, just as if you were watching a ballet, you can actually forget about reading the subtitles and just lose yourself in the mesmerising action on screen. The complex, artificial structure of the narrative is echoed in the theatrical colour schemes and the formal yet melodramatic acting style. Nobody does anything by halves in this film, and characters are always either enraged with passion or cool and impassive as water. Emotions and moral imperatives are as fixed as the colours - and though, like the colours, characters may shift continually as their stories unfold, yet there are no shades of grey to be found. And for me, this was a bit of a problem. Each scene is so deliberately picture perfect, each action so controlled and precise that it's hard to feel emotionally involved. The poignant ending should have you in tears, but the highly stylised way in which it was presented makes emotional connection hard. Beautiful, remote and somehow untouchable, Hero is a breathtakingly spectacular film that has to be seen on the big screen to be truly appreciated. The cinematography is truly amazing, the special effects seamless and the settings and characters just gorgeous. You'll gasp, you'll sigh, you'll be on the edge of your seat. But it has to be said, you probably won't cry.